According to the Journal of Safety Research, bike share riders are less likely to sustain serious injuries while riding their bike than bike riders who do not use bike shares. Can bike shares make cities safer for drivers and bikers? Can they prevent accidents? Bike shares are currently found in over 800 cities across the world. Why are bike share users safer? Some believe that bike share riders might be safer because they use bikes in areas where there are likely to be bike paths and heavy bike traffic. Bike shares may also be present in parts of the city where city design already favors bike users. According to Outside, bike sharing increases bike use in cities. It gets people out of their cars and helps them consider alternative forms of transportation. Bike sharing makes riding more accessible for the average person. In New York City, for example, bike shares are available throughout the city. Riders can pick up a bike in one location, ride to another location, drop off the bike, and continue on their way. According to the Journal of Safety Research, “bikeshare was found to have a positive impact of physical activity, leading to an additional 74 million minutes of physical activity in London, [and] 1.4 million minutes of physical activity in Minneapolis/St. Paul, for 2012.” Could this help many Mississippians become more physically fit? The study also found that lower-income users cited the importance of saving money compared with other transportation options. In a study of London’s system, members who resided in poorer areas had higher trip rates than those living in more affluent suburbs. This could be another benefit for Mississippians. However, bike riding does come with risks, usually because drivers don’t always know how to share the road or they are distracted. 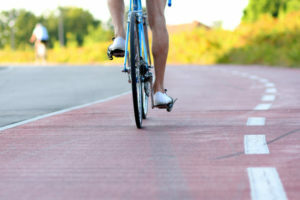 If you or a loved one was injured in a bike accident in Jackson and the surrounding areas, Malouf & Malouf are car accident lawyers who may be able to help you. Our firm can review the circumstances of your crash to determine who may have been at fault. Often a small mistake made by a driver can result in serious consequences for bikers. Visit us at https://malouflaw.com/ to learn more about how our firm can protect your rights.